Posted by Amanda Hicks on Tuesday, February 27th, 2018 at 3:21pm. Once a month, the Jupiter Inlet Lighthouse & Museum host a hike through their 120-acre Outstanding Natural Area. The next hike will be on March 3rd. The group leaves from the flag pole at 8:30 a.m. 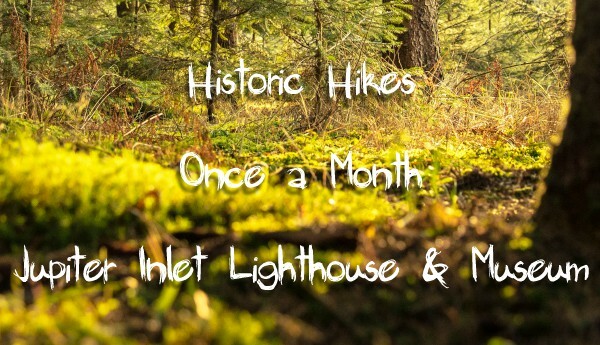 Enjoy a 2-mile trek through the area, learning about the topography and natural history, stopping at historic points along the way including the Lighthouse. The hike lasts about two hours until 10:30. Kids have to be over age 5 and those under 13 need to be accompanied by an adult. Wear hiking footwear, active wear, a hat, sunglasses, and bring a big bottle of water because you'll be out in the sun. 500 Captain Armour's Way, Jupiter, FL 33469.